As far as PetSafe’s wireless dog fences go, the Stay and Play is the most reliable, versatile and stable of all their systems, period. You should take a look at what other users of this fence have to say about it. The Stay & Play collar comes with a charger, so there is no need to replace any batteries. The charging procedures takes roughly 150 minutes, and a full charge will last for a good 2 to 3 weeks, depending on how often your dog will “test” the boundary limits; the more often the receiver is forced to beep and/or apply a static correction, the sooner the battery will be depleted. Expect for the battery to be depleted quite quickly during the dog training process. As with a typical wrench, you will use this one to screw in and unscrew the receiver probes (which deliver the static correction), for example when you need to replace the short probes with the longer ones or vice versa, or when you want to give the collar / receiver a clean. Without it, unscrewing the probes can be a bit difficult and you might hurt your fingers accidentally. The tester has two holes which should be placed as close to the probes as possible. If the probes are working properly and when they deliver a static charge, the tester will light up, indicating proper functioning. The tester comes in handy when attempting to locate the wireless fence boundaries and when placing your training flags. Almost all wireless dog fences come with two pairs of probes: a short pair, and a long pair. The short one is used if your dog has either short and/or thin fur around the neck, while the long ones should be used for long and/or thicker fur. Remember to use the provided probe wrench when attaching and detaching the probes. For the first year beginning with the date of your purchase, you get a full warranty on any malfunctions, regardless of the parts involved. After the year passes, you get a lifetime limited warranty, wherein you’ll be receiving a significant discount for any repairs that might be necessary; depending on the type of damage that occurs, expect the discount repair to cost anywhere between $20 and $60. Please note that failing to adhere to the manufacturer’s safety instructions provided in the manual (such as keeping your transmitter away from moisture etc.) may, in some cases, void your warranty. The transmitter measures 6.4 (L) x 6.8″ (W) x 6.1″ (D), making it currently the smallest of all PetSafe wireless fence transmitters. The unit should be position on the ground floor of your house, approximately 4 feet above ground level. The area where it’s installed should be well-ventilated with as little moisture as possible, and where the temperature never drops below freezing. Remember to place it at least 3 feet away from any metal appliances to minimize signal interference. The transmitter can be mounted to a wall, and a mounting template is provided with the Stay and Play installation manual. Remember not to permanently mount the transmitter to a wall until you have determined and thoroughly tested its final location in terms of signal reliability. 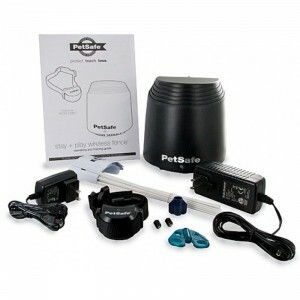 The PetSafe Stay and Play transmitter can contain your dog in a circular area with a diameter of up to 210 feet / radius of 105 feet (0.75 acres), which can be adjusted using the control dial located on the main unit, which allows for a maximum of 8 different settings; the lower the setting, the smaller the coverage becomes. There are two coverage settings: LOW and HIGH, which you can toggle between at will. The “LOW” setting should be used if your containment area will be less than 45 feet in diameter, while the HIGH setting is for a diameter of 45 to 210 feet. 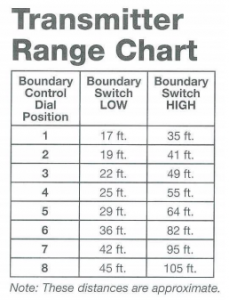 Depending on whether you’re using the LOW or HIGH setting, the 8 settings of the control dial will work differently. Refer to the image below for reference. Please note the values below refer to the radius of the containment area, NOT the diameter. As with all wireless dog fences, there is certain signal instability involved, which will tend to move the location of the boundry from minute to minute. In the case of the PetSafe Stay and Play, this instability is mild and is no bigger than 2 feet up or down; meaning if you set the containment area to a 210 foot diameter, the actual boundry will fluctuate between 208 and 212 feet. The smaller your containment area, the smaller the boundary fluctuations will be. The PetSafe Stay And Play transmitter can support an unlimited number of dog collars. You simply need to purchasea additional PetSafe collars and they will immediately work with the transmitter. Remember that your dog needs to be a minimum of 6 months old and 5 pounds heavy for this wireless fence to contain him properly. In case you need to cover a larger area, you can purchase additional transmitters at a lower cost than the full package and install them in different locations to cover a larger area with the signals, allowing you to contain your dog in an area more resembling a rectangle than a circle. The first one lasts for one hour and is activated when the unit loses access to power, for example if it’s accidentally unplugged. The second, failure signal will sound indefinitely, indicating a system malfunction and requiring you to get in touch with PetSafe’s customer care to solve the issue. Please note that in both cases (power loss / failure), your dog will no longer be properly contained by the wireless fence. One of the smallest and most comfortable collars you will get with any wireless dog fence. Water-proof. The total weight of the collar with everything attached is a little shy of 3.1 ounces, making it one of the lightest models on the market, and significantly lighter than collars sold with other PetSafe wireless fences. It’s also small enough for use with dogs as light as 5 lbs. and with a neck size of 6 do 23 inches. The collar comes with two short contact points, which you can replace with the longer pair that comes with the package, using the provided point wrench. PetSafe recommends to check the tightness of the points up to twice a week. When the collar receiver runs low on energy (20% or below), the receiver light will start to blink red once every 5 seconds. (It will also blink yellow whenever battery levels drop below 60%.) You can then plug the battery charger into the receiver charge Jack and you’ll see a red light, indicating charging is in progress. Once fully charged (typically 2-3 hours when charging from a 20% energy level), the red light will turn green, indicating the charge has been completed. The system has a built-in safety to protect from overcharging. Once fully charged, the receiver will be good to go for up to 3 weeks, depending on how often it delivers corrections. Please note that the battery cannot be removed, as it is built directly into the collar receiver. You can now press the MODE button as many times as you want to increase the static correction level (one press = one level increase). In very rare cases, your dog might enter the boundary zone and despite static correction being delivered, he could freeze in place and stop moving. To prevent the receiver from delivering static correction for too long in a case like this, correction is never delivered for longer than 15 seconds uninterruptedly. Remember that no wireless dog fence is going to contain your pet without proper training of your dog and configuration of the fence boundaries. Please refer to our training and configuration guides section for more information on the subject. If you’re looking for a reliable and affordable wireless pet fence that won’t let you or your dogs down, and which can support an unlimited number of dogs, the Stay And Play from PetSafe is what you are looking for. Take a look at Amazon.com’s price on this wireless fence.